They are here ! The KEEN San Jose 6″ soft toe “gingerbread/off-white” street boots. The shipments are on the road and will be arriving at the Reddhart stores just after the Easter weekend. 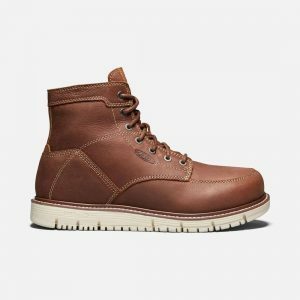 These are hot boots….and Reddhart is the place you can find them in Canada. We will also have them up on sale on our website as well. Stock is limited and when they are gone , that’s it for the season. Reddhart is THE store for all your KEEN needs, and special orders are never a problem. You can also shop our website at www.reddhart.ca. We take personalized service to a higher level.